Development of vaccines that led to the eradication of major infectious diseases (e.g., smallpox) is one of the greatest success stories in modern medicine. Molecular identification of tumor antigens has ushered in a new era with optimism for similar success against cancer (1–3). 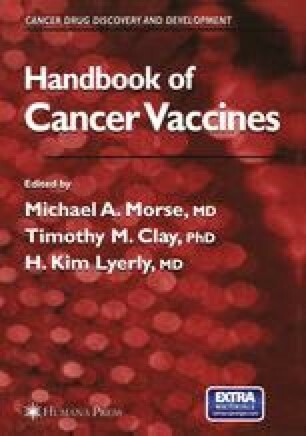 However identification of tumor antigens alone is not sufficient for producing effective vaccines. This is perhaps best exemplified by chronic viral infections such as the human immunodeficiency virus (HIV), for which the antigenic targets have been known for some time. Vaccines are composed of both antigen(s) and adjuvant(s). Effective vaccines also require attention to vaccine delivery and vaccine adjuvants, or enhancers of immunity. These adjuvants play a critical role in determining both the quantity and quality of the immune response to the antigen (4). Dendritic cells (DCs), nature’ s adjuvant, are antigen-presenting cells (APCs) specialized to initiate and regulate immunity (5,6). Here, I will discuss the scientific basis for targeting DCs to harness the immune system against cancer. Use of these cells in cancer immunotherapy has been bolstered by improved understanding of DC biology and presentation of tumor antigens in vivo (6–9).